When you look in the mirror, do you see sagging, excess skin above your eyelids, or puffiness under your eyes? If so, it may benefit to look into eyelid surgery in NYC. Eyelid surgery, also known as blepharoplasty, is one of the most popular plastic surgery procedures to date and can have a positive effect on your overall appearance. If you are considering this procedure, read on for three things you should consider before booking a surgery date. The first thing to consider is if you are a good candidate for this procedure. If you have loose or sagging skin that creates folds in the upper eyelid, fatty deposits or puffiness in the eyelids, bags under the eyes, or excess skin and fine wrinkles of the eyelid, you may be able to benefit from eyelid surgery. While doing your own research into candidacy can help you in your plastic surgery journey, a consultation with a board certified plastic surgeon is the best way to tell if this procedure is right for you. It is also important to understand just what eyelid surgery entails. 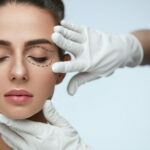 There are three main techniques that are available today: upper eyelid surgery, lower eyelid surgery, and double eyelid surgery. Upper eyelid surgery is done to address the upper eyelids. It can improve sagging skin of the upper eye which can impact vision, as well as give the eye a more open appearance. Lower eyelid surgery is done to address the lower lids and eyes and focuses on removing wrinkles and baggy skin for a more youthful appearance. Double eyelid surgery encompasses both the upper and lower eyelids for an overall improvement in the appearance of the eyes. As with any plastic surgery procedure, eyelid surgery comes with possible side effects. Be sure to fully understand any possible side effects and complications so that you are fully informed when making the decision to undergo this procedure. The most common side effects include scarring, bruising, and swelling. The full list of side effects can be discussed with your surgeon during your consultation. If you are interested in learning more about eyelid surgery in New York, contact 740 Park Plastic Surgery today to schedule a consultation with Dr. Maman or Dr. Broumand.